PROJECT MANAGEMENT INTEGRATION « THE BRYCE IS RIGHT! – Success resides in taking an integrated approach, not piecemeal. About ten years ago I wrote a paper titled, “Why Project Management Fails.” In it, I contended one of the reasons for failure was because of a “lack of consideration for the magnitude and complexities of project management and attack it in piecemeal.” Frankly, nothing has changed over the last ten years to lead me to believe this has changed. * Project Planning involves such things as defining Work Breakdown Structures (WBS) and precedent relationships (methodology). This becomes the bedrock of all other project activities. However, planning also includes the application of human resources to project assignments. To do so, a Project Manager needs to consider what human resources are available, their skills and proficiencies (Skills Inventory), and their work schedules (Resource Allocation). * Project estimating is an expression of the amount of time necessary to complete a project task. It is also used to calculate costs and project schedules. Ultimately, estimates represent personal commitments by workers to project assignments. 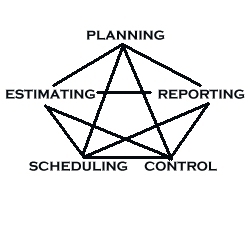 Of course, we cannot calculate an estimate without the WBS as defined in project planning. * Project scheduling is a projection of start and end dates of project tasks, and is calculated from worker estimates, their work schedule, and work environment (an effectiveness rate which considers interferences). This also requires the WBS and precedent relationships as defined in Project Planning. * Project reporting – workers must routinely report their progress by reporting the amount of time spent on project assignments during a given period (usually weekly), along with the amount of time remaining on each task. Over runs and under runs against estimates cause a chain reaction in project schedules. Again, this requires the WBS and precedent relationships as defined in Project Planning. For example, if a project task is completed early, the ensuing tasks can start early. Conversely, if a project task is completed late, the ensuing tasks will be delayed. Project reporting also analyzes the amount of time expended, its cost, which is normally billed to a user area. Time reporting includes Direct Time (work on project assignments), Indirect Time (interferences), and Unavailable Time (e.g., vacations, holidays, time off). The reporting of Indirect Time and Unavailable Time is useful for calculating realistic schedules and managing the worker’s work environment. Capturing time in this manner has the added benefit of developing standards for estimates. * Project control – without the other activities, project control is impossible. It studies estimates versus actuals, schedules versus actuals, the amount of time and costs expended versus time and costs remaining. Tolerance rates are used to detect when estimates and schedules have slipped to the point it is necessary to take corrective action (e.g., replace people) and recalculate estimates and schedules. – Developing a project plan that estimators and schedulers will ignore serves no purpose. – Developing a project estimate that cannot be used to drive project schedules is a futile gesture. – Developing a project schedule that fails to recognize Indirect and Unavailable Times (nor is tied to resource allocation) is useless. – Reporting time without applying it to project estimates and schedules does not permit project control. – Project control is impossible without a road map (methodology), estimate or schedule. To succeed, it is necessary to remember Project Management is a philosophy of management, not an elaborate set of tools and techniques. I will not deny there are some fine software tools out there, but unless they can be seamlessly integrated into all of your project management activities, it will be counterproductive. The lesson is simple: do not attack Project management in piecemeal, take a comprehensive approach. You will have a better chance for success and produce superior results. NEXT UP: AT THE BREAKING POINT – Ramblings regarding the ideological divide in this country. LAST TIME: WORLD WAR III? – Has it already started?